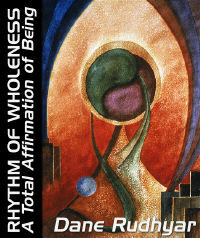 While Part Two dealt with the pattern of the cycle of being, the Movement of Wholeness, in terms of essentially abstract principles which can be applied universally. Part Three focuses attention upon the cycle of being of a particular entity experienced as a man or woman. The biologist and the psychologist consider such an entity primarily a physical organism whose life span extends between birth (or conception) and death. But from the perspective of the mental attitude outlined in Parts One and Two, the life span of a man or woman constitutes only one half of a whole cycle of being � its symbolic Day period of predominantly objective activity and consciousness. The person called Peter or Jane refers to this Day hemicycle. A full understanding of such a person requires the consideration of the other half of the cycle � a Night period of predominantly subjective activity and consciousness. The difficulty encountered when attempting to deal with this Night half-cycle is that it does not refer to the human being known as Peter or Jane, a being whose physicality � one comes to realize � is only the external appearance assumed by a combination of factors which in their, togetherness constitute a whole of being. After death, this combination ceases to exist as the Peter or Jane we knew as a living person, yet the component factors in this physically experienced person do not disappear. As I have repeatedly stated, there is no place for non-being in the concept of wholeness of being I am presenting. There is only being � being in a perpetual and rhythmic (or cyclic) state of transformation in which a continual combining and recombining of elements occur. Being implies a multiplicity of elements, because "to be" is to be a whole � one among the seemingly infinite (because indefinable) number of concretizations of Wholeness. When I speak of Peter or Jane, I have in mind a temporary combination of factors constituting a human being in the state of physical existence. This combination breaks down at death, but the Wholeness of which this being was but one phase retains its identity of being in new conditions. The physically experienceable Peter or Jane is not a whole of being. He or she represents � I repeat � only a half-cycle of being. Each of the diverse elements combined to constitute a particular person during this hemicycle follows its own course during the other half of the cycle, the symbolic Night period. A new combination occurs when the entire cycle ends, because the end of one cycle is also the beginning of a new one. The continuum of being has no end; the Movement of Wholeness never stops. The new is the progeny of the old. In a sense it is the old reborn; but not all the elements of the old combination, Peter or Jane, will be parts of the new combination, John or Barbara. This must be so because the cycle of being of a particular human whole is an open cycle. It has to be open because it is actually only a very small sub-subcycle within the cycle of humanity, the planet earth, the solar system, and the galaxy. During the period between the birth of the old combination and the birth of the new combination, the entire universe � particularly the whole planet and human societies and their cultures � changes, perhaps considerably. Yet the new can be called the progeny of the old because the accomplishments and the failures of the old leave a legacy of karma to the new. Karma compels (or in a relatively few cases. Compassion impels) the formation of a new human being, John, because Peter could not fulfill during his physical life the Wholeness of being of which he was a fleeting manifestation. So stated, the concept of "reincarnation" is far more complex than its popular formulation. The latter is not only unsound and philosophically unsatisfying, but based on a narrow and inhibiting psychological attitude. It arises from the spiritual materialism of a culture whose exclusivistic scientific empiricism and worship of personal values makes it nearly impossible for a man or woman to envision the wholeness of his or her being. The word "reincarnation" recently has become a catchword � often financial bait � conveniently used to attract people whose lives seem banal, confined, and empty. Evidently it implies that a mysterious entity, the soul, is incarnated in a human organism; that in some manner this soul survives the death of the physical organism and after a period "re-incarnates" in an embryo developing in a woman's womb. The basic problem is how to identify this soul, define its origin and nature, and outline what can be understood and expected of its future. To solve this problem satisfactorily requires explaining not only the relationship between the soul and the body in which it is said to have incarnated, but also the relationship between the soul and the psychic and mental components of the person as a whole. The solution requires going beyond the particular person to the relationship between the soul, the person, and the culture and society which have formed the person's character and basic approach to life experiences and learned knowledge. Religious and philosophical traditions of all cultures � and today Western science � provide either general approaches or dogmatic answers to this problem. Neither the traditional Christian-European approach nor that of the new psychology (in its various forms purported to be founded on empirical and "scientific" research) provides truly satisfying and wholesome foundations for today's much advertised "new age" consciousness. What follows here is an alternative approach, not only to the problems involved in the concept of reincarnation, but also to the still more basic one of what constitutes, in the largest sense of the term, Man. In Part Two, the term was given an abstract and universal meaning in terms of the whole cycle of being. Now I shall attempt, first, to outline a picture of the basic factors entering into the total life-situation we call a human beings � body, psyche, mind, spirit � then, to suggest what happens to each of these factors after death, during the symbolic Night period of the entire human cycle, and what is involved in the recombination of these factors into a new being.